The top two industry leaders in daily fantasy sports (DFS) are DraftKings and FanDuel. They are by far the leaders in guaranteed money payouts, player pool, and games offered, and current estimates are they own over 90% of the DFS market. They both share similarities and have distinct differences as well. The preferences for the various differences really come down to personal tastes but we will review both of them. Both DraftKings and FanDuel offer NFL, MLB, NBA, NHL, Golf (PGA), WNBA, Soccer (SOC), and NASCAR (NAS). The difference here is DraftKings also offers the Canadian Football League (CFL), Mix Martial Arts (MMA), Tennis (TEN), League of Legends (LOL), and College Football (CFB) where FanDuel does not. DraftKings are quick to add new sports to their site, and with the additional sports to play on DraftKings, they have the obvious advantage in year-round sport options. 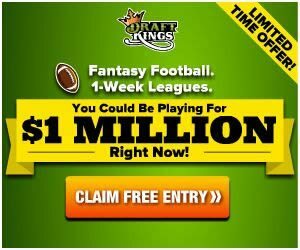 DraftKings usually offers at least one large weekly freeroll throughout the year. FanDuel does offer free contests, depending on the season (i.e. the beginning of the NFL season, etc.). This was a feature offered by DraftKings only, but FanDuel now offers contests with both the late swap or non-late swap features. For example, on FanDuel non-late swap contests, your entire lineup is locked (cannot be edited) the moment your first player’s game starts. With contests with the late swap feature, only THAT particular player is locked if his game has started, not the entire lineup. For example, if you have a player playing a prime-time game (Sun./Mon. night), and find out he will be a last minute scratch for whatever reason, you could swap that player out and replace him with someone else before kickoff, and avoid eating that donut he would have otherwise dropped on you. It is recommended to use your latest game time start player in the flex spot since if you do have to swap him out, you have more flexibility to replace him with a RB, WR, or TE. This feature is extremely handy since last minute in-actives/injuries are possible. Some players like this feature and others do not so this will come down to a personal preference. Both DraftKings and FanDuel interfaces are very similar as they are both easy to navigate and MOSTLY have the same options. They both have filter options to narrow down your contest searches by sport, contest type, entry fee, prize pool, player pool, GPPs, etc. They both offer quick access to your various contests (live, upcoming, history, and contest creation). When it comes to creating lineups, DraftKings allows you to create any number of lineups for any sport, without having to enter a contest first. This is a very convenient and time-saving feature that FanDuel does not offer. For FanDuel, you have to enter a contest first then create your lineup for that contest. Once you have created your lineup for that contest and submitted it, then your lineup is created and can then be edited later if need be. Just take a few seconds to create any lineup, submit it so you are locked in, then go back and edit it with your desired players. This way you won’t waste your time creating a lineup, submitting it, and then find out that contest has already filled in the mean time, and have to start over in a different contest. Individual player info/news/stats are available on both sites. FanDuel shows fantasy points per game (FPPG), games played, game matchup, and player salary. DraftKings shows FPPG, game matchup, player salary, and opponent rank vs. position (OPRK). DraftKings also displays opponent matchup statistics. FanDuel offers an option to show your opponents’ win totals by sport for all cash games played for each contest. This can be extremely valuable to scout who you may be going against before entering a contest. For example, in a head-to-head contest available, if you see that your opponent has 20K+ cashed wins, you may want to rethink that one unless you want to play with sharks. DraftKings also offers a similar feature identifying minimum player thresholds of number of contests entered and cash won. Both DraftKings and FanDuel offer season-long leagues for any sport offered. The leagues can be personally customized in a variety of ways. Leagues can be free or have a cash entry fee. The league leader board features track your performance against your league members. League contests can be set up once, without having to recreate that contest for future weeks again. Both sites require you to fill 9 positions. As of the start of the 2018 NFL season, FanDuel has replaced the Kicker position with the Flex (RB/WR/TE) position. DraftKings adds 3 bonus points for exceeding the above yardage thresholds. DraftKings also utilizes full (1) point per reception (PPR) scoring where FanDuel uses half (.5) PPR scoring. FanDuel also penalizes players for fumbles more harshly than DraftKings. The salary algorithms for each site are tailored towards their specific scoring systems. For example, DraftKings salaries for receivers tend to be slightly higher relative to FanDuel because of the full PPR and bonus scoring potential. FanDuel added the Super Flex lineup style contests. Compared to their salary cap style contests, the Super Flex contests eliminated the third WR position, the Kicker position, and the Defense position. Replacing these positions are the Flex position (RB/WR/TE) and the Super Flex position (QB/RB/WR/TE), for a total of eight positions to fill. This is DraftKings version of the Super Flex. This format consists of 6 roster spots, which include 2 QBs, and 4 Flex (RB/WR/TE) spots. Another DraftKings format which consists of 6 roster spots that includes any combination of QB/RB/WR/TE/K/DST. One of these spots will be a captain. This spot earns 1.5X fantasy points but also costs 1.5X of the player’s base salary. DraftKings also offers Pick’Em style contests. These contests do not have a salary cap or salaries assigned to players. There are eight tiers of comparable players, usually with each tier having 10 or less players to choose from. Simply select a single player from each of the eight tiers to create a lineup. Pick’Em contests are currently available for NFL, NBA, NHL, and MLB. FanDuel Single Game formats require only 5 flex player slots to fill out. You may choose any combination of QBs, RBs, WRs, TEs, and Kickers as long as the total salaries fits under the $60,000 salary cap. To learn about DraftKings in more detail, click here to read our review or check out our DraftKings new player promos as seen on TV for a free contest entry and the maximum benefits possible! To learn about FanDuel in more detail, click here to read our review or check out our FanDuel new player promos for the maximum possible benefits offered by FanDuel! In 2016, both DraftKings and FanDuel have crossed the pond and opened their digital doors for business in the United Kingdom (U.K.). In the summer of 2017, FanDuel pulled out of the U.K. after one year. In 2017, DraftKings rolled out their full sports offerings in Austria, Ireland, Germany (Deutschland), and Malta. With the legalization of sports betting in the United States, both DraftKings and FanDuel are implementing sportsbook options as soon as the states allow and are able to, but this process has just started and may take a long while for this option to become a reality. Both sites are hands down absolute winners and the industry kings, another similarity they both share. The best way to really get to know a site is to play on them to really experience which nuances work for you best, so we would recommend playing on both. If it turns out you prefer one site over the other, you can easily migrate to your preferred site. Some of the differences highlighted come down to personal experience and preference, but if I could only choose one site to play on of every site possible, it would be DraftKings.